Freedom of the road, that is what we are all about. Riding a motorcycle is one of the most liberating experiences you can have. For riders who want to experience the road without the full-face helmet construction, yet value as much coverage as possible, Scorpion has a helmet for you. The new Scorpion EXO-CT220 Helmet comes to the lineup as a direct replacement for the CT200, which we saw step aside over two years ago. 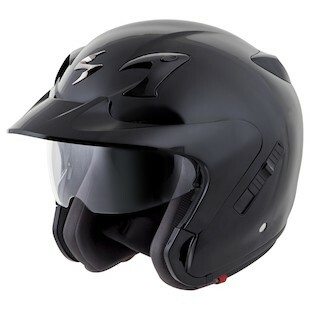 With polycarbonate construction, the CT220 features a list of safety features that put it in a unique class for three-quarter helmets. From the emergency-release cheek pads, to the anti-roll-off system, and a specialized wing and lock combination to keep your shield from lifting at speed, it is a well designed piece of moto gear for any condition. You will also appreciate convenience features such as a removable and washable liner, drop-down three-step-adjustment sun visor, and a full-coverage face shield. If you are concerned with being seen (and you should be! 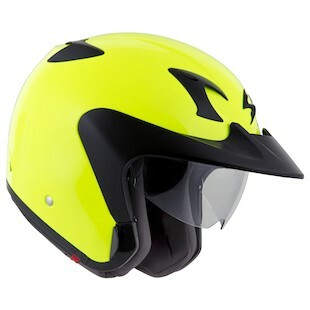 ), the Scorpion EXO-CT220 Hi-Viz Helmet offers all of the features of the solid option, yet with the Hi-Viz yellow paint scheme. This is a great choice for any rider who spends time on the road during inclement weather or in low-visibility conditions. Enjoy the open road… we all do! If you prefer not to wear a full-face helmet on your adventures, then check out the highly functional and incredibly well priced option in the Scorpion Fall 2014 Collection.